Introducing the League of Extraordinary Ladies! I have posted some of these pics in the past, but really it is time for me to pull them all together. The premise is the same as that other League, only gathered this time are powerful women. I am going to alter backgrounds a bit to better suit the time and the place. Overtly these are for Leagues of Adventure, but I think I can safely mix in some Space: 1889 as well. I am also using the magic systems found in Secrets of the Surface World and Mysteries of the Hollow Earth. 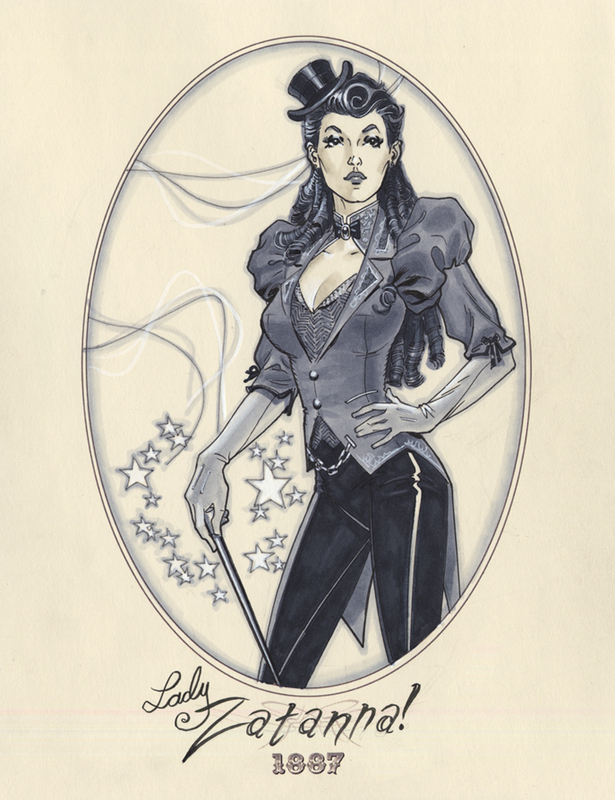 In this case I am doing a more straightforward conversion of my Cinematic Unisystem version of Zatanna. * While Sorcery is Charisma based in Secrets of the Surface World, I am going with Willpower Based here since this is a straighter point-for-point conversion. I want to play around with different bases for Sorcery. I might make Witchcraft Charisma based and High Magic Intelligence based. Zatanna can choose any spell, but she must be able to speak backwards.